A daily ration of milk against welding fumes: This used to be the be-all and end-all of occupational safety. Yet, the legend about the protective effect of milk against health damage caused by welding fumes is partially still persistent today. Yet, this is really more of an old wives’ tale than real fact. Milk against welding fumes used to be the mantra against the health consequences caused by hazardous substances during welding. Companies gifted their staff a daily ration of milk and thus considered their occupational safety duty done. Sometimes, a quarter liter of milk is said to be the required dose, other times, it is an entire bottle. This was, however, in times in which extraction technology and ventilation technology played absolutely no part yet in metal processing businesses. Yet, the old wives’ tale of the protective milk against welding fumes still persists in the minds of some welders. 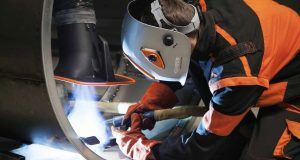 In welding forums, the apparently therapeutic effects of milk are discussed time and time again, when the conversation comes to the health consequences of welding fumes. Yet, where does this point of view come from? Milk supposedly aids the of deslagging hazardous substances. Milk is said to have mucigenous properties. This means that it promotes the production of mucus. More mucus production equals faster discharge of the welding fume particles. The high fat content in milk was said to bind the toxins in the body. It is funny that obviously no one took the time to properly consider the different paths through which milk and welding fumes enter the body: Whilst welders inhale the welding fumes, milk is drunk. This alone should have been enough to exclude milk’s protective properties against welding fumes. These days, scientific findings are much further along. Not just since yesterday, National Poison Centers warn against giving milk to victims of poisoning – e.g. if welders get metal fume fever. According to all available scientific findings, milk has absolutely no protective or preventative effect against welding fumes if particulate or gaseous hazardous substances are inhaled. Quite the contrary: Milk is suspected to increase the absorption of toxic substances. The Health and Safety Executive (HSE) even warns explicitly on their website: „Don’t believe the stories about drinking milk before welding. It does not prevent you getting metal fume fever.“ Also: So don’t believe the stories of drinking milk before welding. It doesn’t protect you from metal vapour fever. The German experts agree. It is no coincidence that the German Occupational Safety Laws do not mention a daily ration of milk, but recommend extraction technology in businesses to safeguard employees. 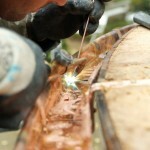 This also answers the question: If milk does not help against welding fumes, then how should welders protect themselves? 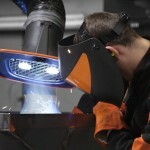 The same advice: No welding should take place without an effective welding fume extraction system . 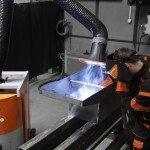 If you want to stay healthy during your career or if you want to win motivated employees for your business, then you must rely on extraction technology – and you can drink the milk for breakfast, just not for protection against welding fumes.